When the graduation ceremony was over, I sat in the car and cried. Bridgette was crying too. Poor Jeff. 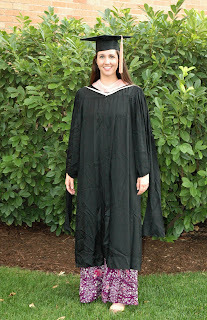 I couldn't help but think how graduation was a truncated version of my whole graduate experience. -Babs had a bad night, no sleep for anyone. -Send Jeff to work, tend my child who cries all morning. -Try to put her down for a nap. No takers. -Chuck her in front of the TV so I can get ready. -Pick Jeff up from work, pick up baby's robe from south Provo. -Arrive early to meet cohort. -Manage to arrive late to every other venue. -Run from place to place. Run in heels. -Swim upstream against the processional current to get to my place in line. Very obvious. -Get out of order while taking "official" photos, screw up their numbering system. -Realize that "N/A" was a really stupid thing to write on the order form for both email and phone. -Track down the order form people. -Receive diploma, babe in arms, without tripping or passing out! -Sit down in the front row, baby cries. Very obvious. -Track down Papa Jeff in the stands, who helps, like always. -Enjoy the speakers with my friends while we add commentary and snicker. -Realize after the closing remarks that I haven't eaten all day. -Grab an orange juice and a brownie. -Go to take graduation photos. It's raining. -Take them inside, on the crowded track. -Rain stops, take a few solo shots outside. The rest of the day was better. I had planned to cook dinner for the open house at six, but Jeff made me sit and rest while he cleaned the house (ie: piled everything on our bed) and ordered pizza. The open house was a lot more relaxing, and it was fun to see a few family members and many good friends. Thanks to those of you who stopped by, hung out, and helped us eat our pizza! Look at baby's cute little face! We haven't received BYU's "official" photos yet, but I hope they turn out well. 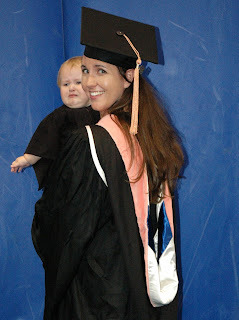 Sporting the "salmon" Master of Public Health hood. With my good friend Dr. Gene Cole who helped me get through all my graduate "disasters." Stressful? Yes. But a beautiful day, in the end. A few days later we took some more shots of baby in her robe, when she was in a better mood. But first, here she is "standing." She's not really, but this is what she'll look like when she finally realizes that legs are pretty useful. And one to grow on. I was attempting to document the Einstein hair, but who can refuse saying "awwww..." at this? Congrats!! And after hearing about your day, I'm sure I can definitely understand the tears. 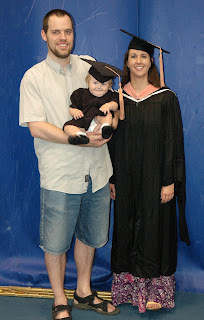 I love B's little cap and gown! Congratulations! I'm not sure if you're determined, crazy, or both! Got any plans for that degree? Wow! That was quite the day! I'm glad it turned out ok in the end! Way to go, Kel! I'm so impressed you pulled it all off, both the actual Masters and the graduation day itself. Sorry it wasn't a "picture perfect" day, but you know the stress and tears just help make it all the more memorable. Hoorah! Congratulations! You girls look so pretty in your graduation cap and gowns. I hope this new season in your life is rewarding and relaxing. Wow, way to go Kelly! Although you are kind of scaring me b/c I start my first graduate class on Thursday. I thought I'd take one and see how I do with the three kids and all else. I LOVED that you and Bridgette both had caps and gowns. So cute. Way to go on getting your graduate degree! Any chance life will slow down and smooth out for you guys now? Oh, days like that can just put you to tears. Sorry it was stressful but I'm so proud of you. I love all the pics of Bri in her robes too. I think my favorite is her looking up. Way to go!!! You did it!!! Oh, and gotta love a hubby's idea of cleaning. Yay, Congratulations! What a day! Aren't you so glad to be done? I know I was when I finished. You look great in your cap & gown. Bridgette looks so cute in the graduation get up too! Congrats! What an accomplishment! I love the photo of you and the little one at the top very cute. Kelly! Congratulations and sorry I missed you guys. I showed up later but probably too late or in the wrong place.